The Crossover Wall and Floor are now both available on our free mobile app! HTP's app is user friendly and perfect for when you need guidance on the job. The app has separate sections for the RGH Wall and the RGH Floor, making information even easier to find. It includes installation manuals, parts drawings, installation drawings, photos, brochures, and videos. 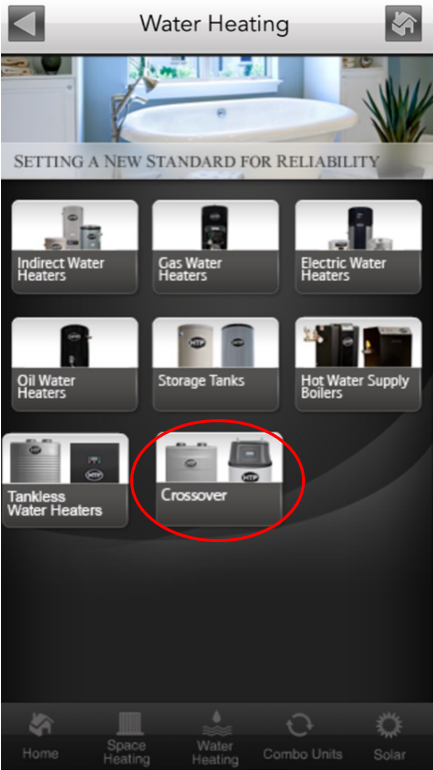 The Crossover Water Heater is a revolutionary product and was designed to be the most highly efficient affordable residential tank type product in the industry. With two technologies in one, you'll have immediate start up and endless hot water. HTP's integrated system delivers hot water on demand when you need it most! Additionally, it includes a small storage within its heat exchangers for easy recirculation and fast hot water delivery without pressure loss. Download the app today to learn more!